(This is my experience working and living aboard a treasure hunting ship, the M/V Sea Hunter). The next day started the same as the day before. I awoke early, got a cup of coffee and stepped outside. It was barely 7 am and there were already a few boats off the port side of the Sea hunter. They were waiting for the offloading to begin and they wanted to be sure they had a front row seat. By 8 am the temperature was rising and again, the sea was dotted with many small boats. Within minutes the quiet of the morning quickly turned to loud chatter and constant activity. The United Nations Police boats were back and patrolling the area. When things seem to get a bit out of order they would sound their horns. This would usually calm things down. I was worried someone would get hurt. 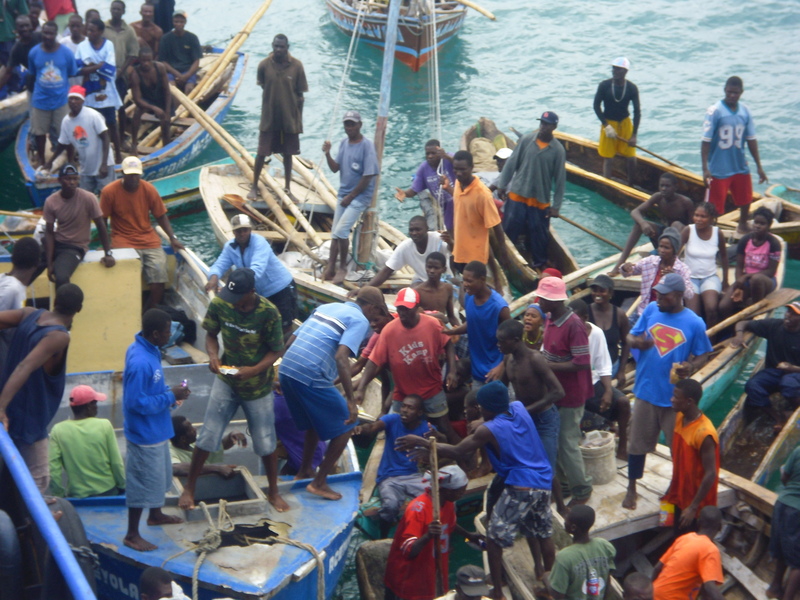 The boats were rocking back and forth and some of the Haitians would jump from boat to boat. The ones in the back would run across other boats, grab a box full of aid, turn around and jump again from boat to boat. How they did that without falling and getting hurt was a sight to see. I guess everyone wanted to be sure they too received some aid to take ashore. When I wasn’t inside preparing a meal or cleaning up, I would go out onto the deck and pitch in wherever I could. 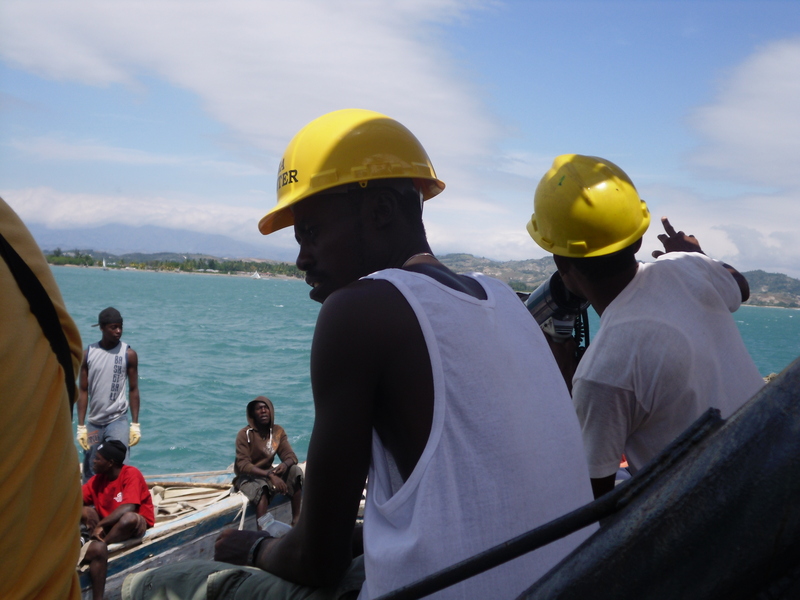 It was a little tough as many of the Haitians only spoke Creole so it was tough to communicate. However, we had Felix and KiKi to help out. KiKi was a shy young man with a giant smile. He wanted to help and would do whatever was asked of him. One of the crew decided to put KiKi in charge of an area in the back of the ship where we were offloading crates of water. He was given a bull horn and was quickly shown how to use it. As he headed towards the back of the ship you could tell he was proud to have such an important job. After a few minutes, I headed back to see how he was doing. As I approached KiKi, I noticed that yes indeed he knew to hold the lever tight as he spoke through the horn, however, he didn’t realize you should be a safe distance away from those you are speaking to. Instead, he was holding the bull horn right up in the face of the person he was speaking with and he was yelling. Ouch, that had to hurt an eardrum or two. I respectfully showed him the proper way to use it and all was good. He did a great job for the remainder of the day. It’s funny how we take for granted little things, like knowing how to use a bull horn. We did encounter some trouble on the third or fourth day of unloading. Boxes were being passed from one person to another in a line and then handed overboard to one of the boats. Someone from another boat hopped across and grabbed one of the boxes from the arms of another and headed back to his own boat. An argument started and before you know it there were five or six boats involved. I couldn’t understand what was being said, but from the looks on their faces I knew it wasn’t good. Some pushing and shoving started and a few of them ended up in the water. KiKi was saying something through the bull horn trying to calm the situation down but it seemed no one was listening. 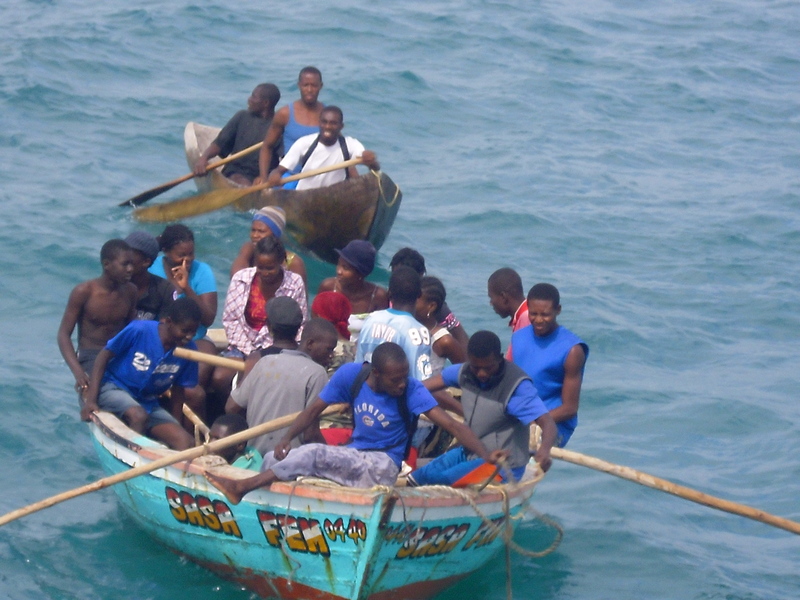 All of a sudden, both police boats revved up their engines and sped close to all the Haitians boats, which caused a giant wake. They did this a couple of times and it forced everyone to either sit and hold on or go overboard. Thankfully within a few minutes things seem to calm down. Greg informed KiKi to tell the crowd and explain that if this happened again, we would stop immediately and there would be no more aid. I hated that he had to do that, but we needed everyone to stay calm. It had been a long tough road getting to this point and we needed it to go smoothly. That evening after dinner, as we sat on the deck to relax, Greg informed us that the next morning he and a couple of the crew were going to take a field trip to meet with Father Marc at Hope Village. It was decided that me, Capt. Esper, Julia and Alex would accompany Greg to the orphanage. I was so excited I could hardly sleep that night. I had heard so much about Father Marc and was so looking forward to meeting him. I also have a deep love for all children and felt it an honor to get to meet them. When I finally did fall asleep, I slept like a baby.